Posted by Eddie & filed under Mountains & hills, Science, August 24 2009. 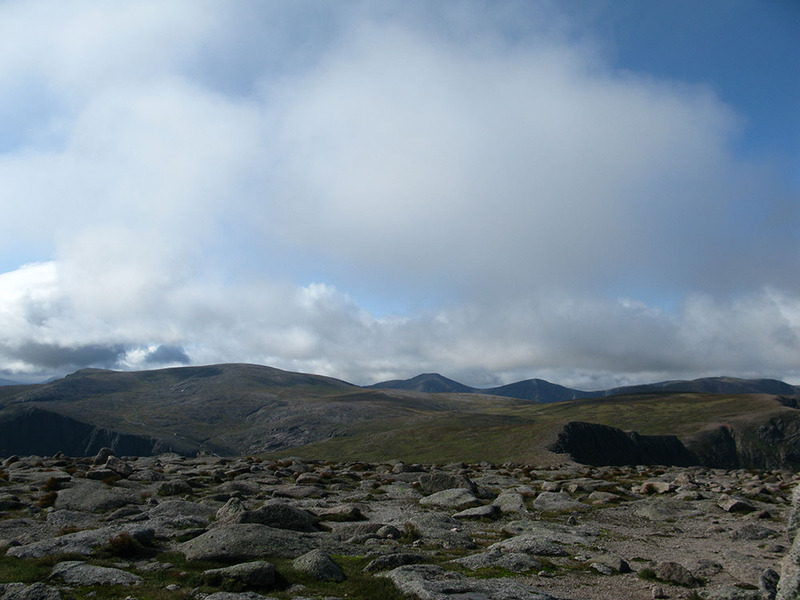 Last Saturday there was a gap in this month’s seemingly endless rain and I travelled to the Cairngorms where I had a good day walking on the Cairn Gorm – Ben Macdui plateau. I managed to get a good view of all the usual areas where perennial snowpatches lie (see this page on my website about this topic). 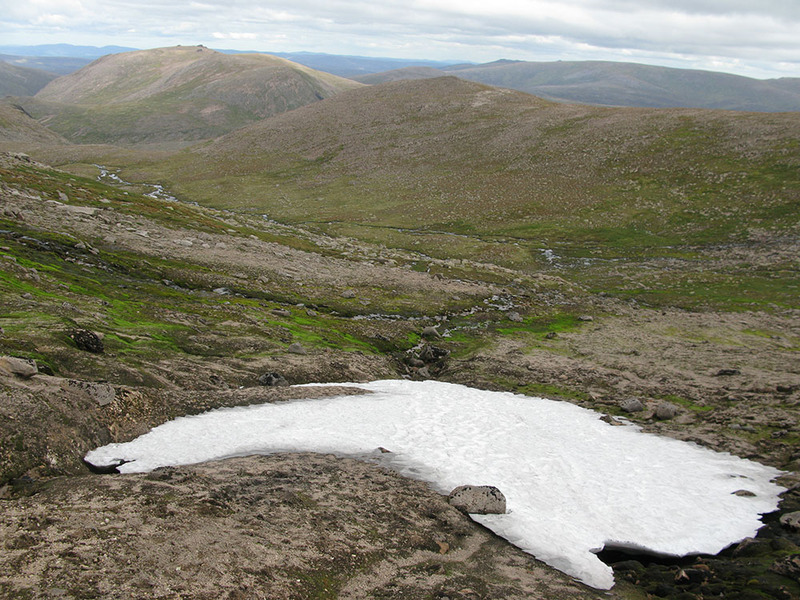 I counted five small patches of snow at Ciste Mhearad, just east of the summit of Cairn Gorm. The largest was about 5m long and was almost entirely covered in wind-blown debris (grass mostly) – perhaps this will give it some insulation and make it last longer, although for this to happen the covering has to be quite thick. A lot of the areas I saw were surrounded by bright green areas of Pohlia wahlenbergii vegetation which was very striking, almost fluorescent. The view from the summit of Cairn Gorm was unusual too, I think it’s the first time I’ve seen this view (almost) entirely without snow! 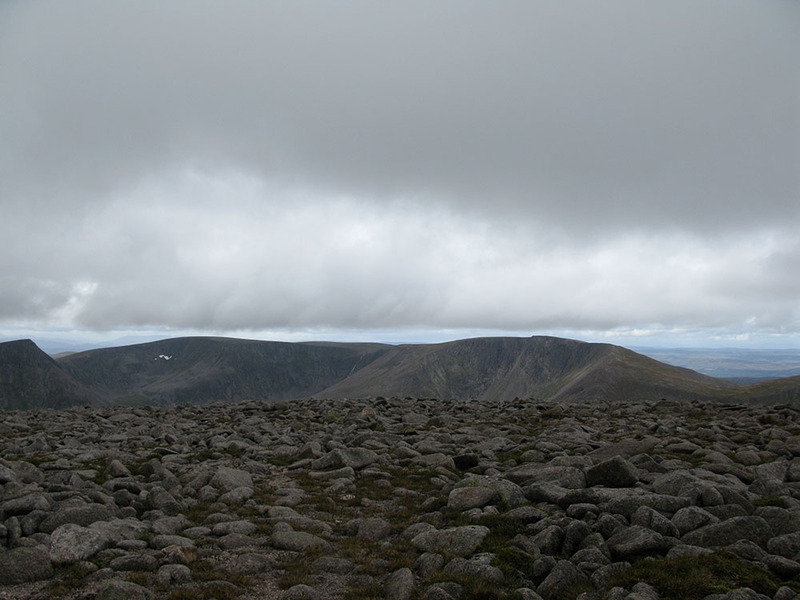 There was only one patch visible to the north-east of the summit of Ben Macdui. I saw no snow at all in Coire Domhain, along the Fèith Buidhe river (although I did see a couple of reindeer from the resident herd here), or along the Garbh Uisge Bheag river. I had thought I might see something at the rocky area where the Fèith Buidhe descends steeply down towards Loch A’an but all the snow had gone – a very big contrast to this amazing video on YouTube of the area that was shot in July 1994. I walked right to the patch visible from the summit of Cairn Gorm, near the Garbh Uisge Mòr river, and was surprised at how substantial this was, easily 10m across and still with some depth of snow in the centre (perhaps a metre?). I think this patch stands a good chance of surviving into September. You can see a photograph of me next to this snowpatch for scale on my website here. Near this snow patch I discovered a single piece of metal lying amongst boulders (photo here). This is almost certainly a piece of aircraft wreckage, but the site is about 1km from the Avro Anson crash site on the other side of Ben Macdui, so this may be from another unknown crash. 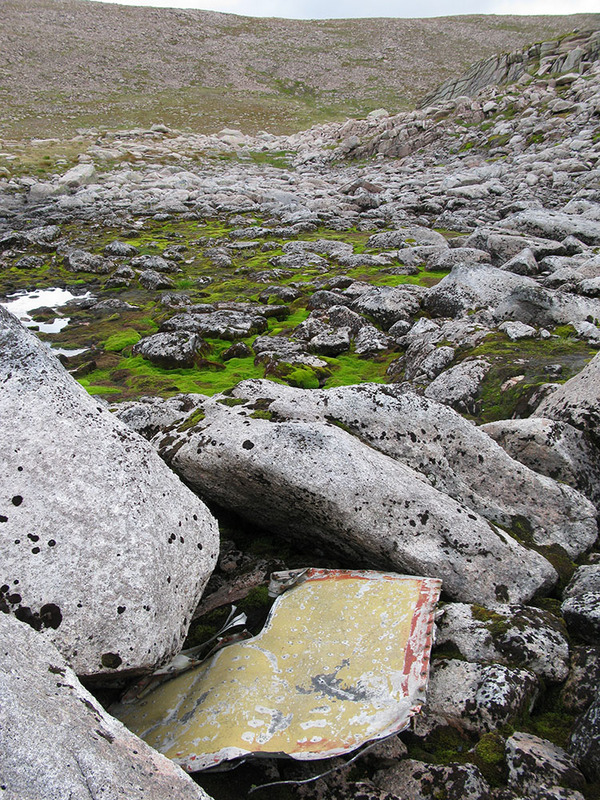 I saw a second patch (photo here) in the Garbh Uisge Mòr, higher up and nearer to the summit of Ben Macdui. This patch was almost as large in area as the first one but not as deep. From the summit of Ben Macdui, I got a good view of the Garbh Choire Mòr patch on Braeriach, and also the small patch remaining high up on the western wall of Coire Brochain. Comparing this current view to this photograph that was taken in August 1967, is pretty startling! 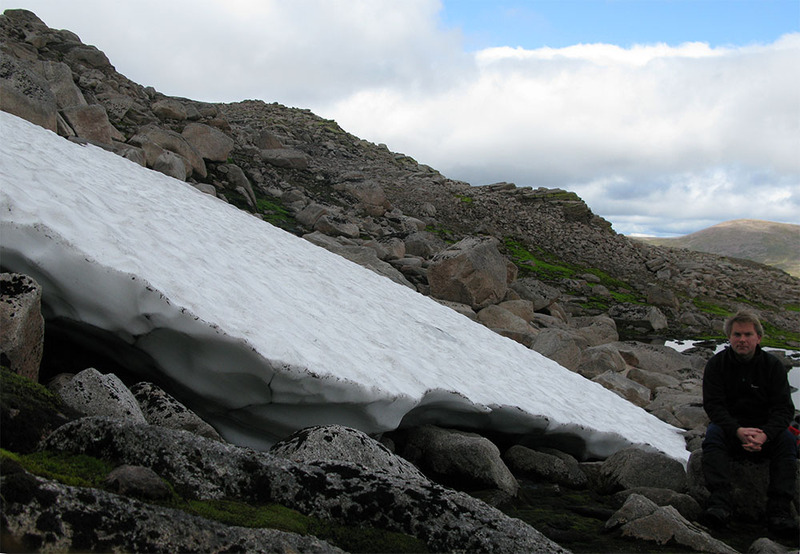 I just managed to see a tiny snowpatch remaining high up on the western wall of Coire an Lochain (the Cairngorm one) but this surely has only a few days of survival left. My overall impression from this trip is that the snow patches on the Cairn Gorm – Ben Macdui plateau are smaller in extent than they were in the last two summers. You can see all the photos I took on the walk on my website here. See also my blog posting about a similar trip to the Cairngorms I made in July last year (‘Summer snowfields in the Cairngorms‘).